One of Hong Kong’s most densely populated districts; this map of Tsim Sha Tsui will give you an idea of where the major sights are and how to reach them. Bounded by Victoria Harbour in the south and Austin Road in the north, the main thoroughfare is bustling Nathan Road. This is Hong Kong’s prime tourist area and where many of the better hotels are located. 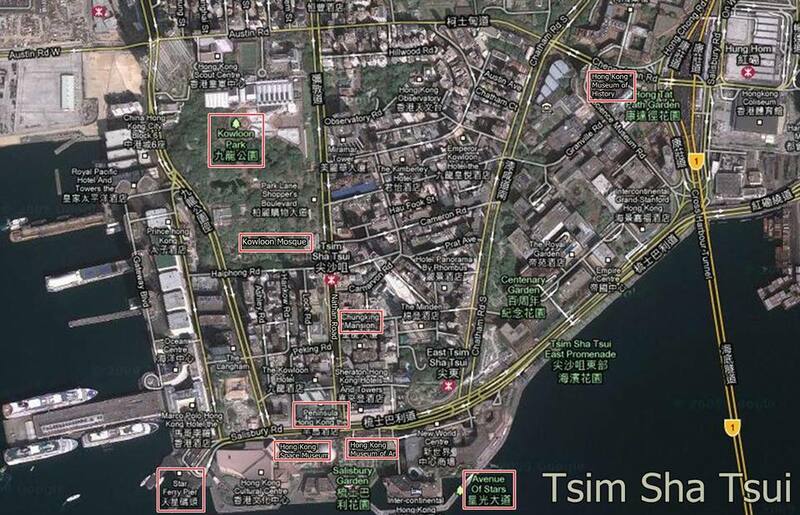 The Tsim Sha Tsui map above highlights all of the area’s major sights and below you’ll find links to tourist guides to each of these sights and various tours of the area. Tour of Nathan Road – The heart of Nathan Road and some say Hong Kong. Packed with people, shops and its fair share of conmen hawking fake watches and suits, this is Hong Kong at its commercial, capitalist best. Head down here by night and find it basking in the glow of Hong Kong's famous neon signs. Star Ferry Pier - One of Hong Kong’s signature tourist attractions, the distinctive Star Ferry have been plying the waters between Kowloon and Central on Hong Kong Island since the late 1800’s. This is still the best way to see the Hong Kong skyline, offering uninterrupted views of the skyscrapers clustered around Victoria Harbour. Avenue of Stars – If you want another picture postcard view of Hong Kong’s skyscraper jungle, there is no better spot to bring your Kodak than the Avenue of Stars. This seafront promenade stretches across the Kowloon peninsula and offers a panorama of Victoria Harbour and Central. Note: The Avenue of Stars is closed for renovation through 2016. Hong Kong Space Museum– Ideal if you have a horde of bored kids in tow, the Hong Kong Space Museum has a host of hands-on exhibits that can twist, pressed and pushed. Visit during Chinese New Year to find out about the importance of celestial bodies in Chinese festivals and horoscopes. Hong Kong Museum of Art – Perhaps Hong Kong’s only, truly world-class museum, the collection here is particularly strong on traditional Chinese crafts and paintings, as well as select pieces from the West. This is also one of the few places you can see an exhibition on much-maligned Hong Kong art. Note: The Hong Kong Museum of Art is closed until 2018 for a major renovation. Chungking Mansions - One of Hong Kong’s most iconic buildings both derided and loved; immortalized in Hong Kong movies, home to some of the best ethnic cuisines in the city, as well as the cheapest accommodation in Hong Kong. The building can be a little intimidating; it's run down and there are touts everywhere, but make it past the entrance and you'll find a building that sums up Hong Kong's multicultural makeup. The Peninsula Hotel – Built in the 1920s, the Peninsula was once the hottest ticket in town for socialites and visiting sheiks. While the colonial party may have sailed off into the sunset, the colonial elegance means the Peninsula is still one of the city’s finest hotels. Kowloon Park - Stretched over 13 hectares, Kowloon Park is one of the few places in Hong Kong you can grab a glass of fresh air. There is also plenty to see. Meet the local flamingos in the pond, watch worshippers pile into the Kowloon Mosque or take a dip in the interconnected outdoor pools - the latter is the hottest ticket in town during the humid months.